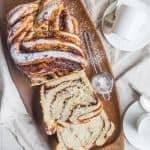 Apple butter cinnamon swirl bread: a soft, moist yeast loaf with ribbons of apple butter and cinnamon sugar in every bite! It’s a cool October morning, and I can’t think of a better way to start the day than with a cup of tea and a warm slice of apple butter cinnamon swirl bread! I made this loaf over the weekend and I’m so glad to be able to nibble on it all week long. It makes a lovely breakfast or afternoon snack. And it’s a great way to use up some of the apple butter we picked up on our most recent trip to the orchard. I bet you have a jar in your fridge too; am I right? 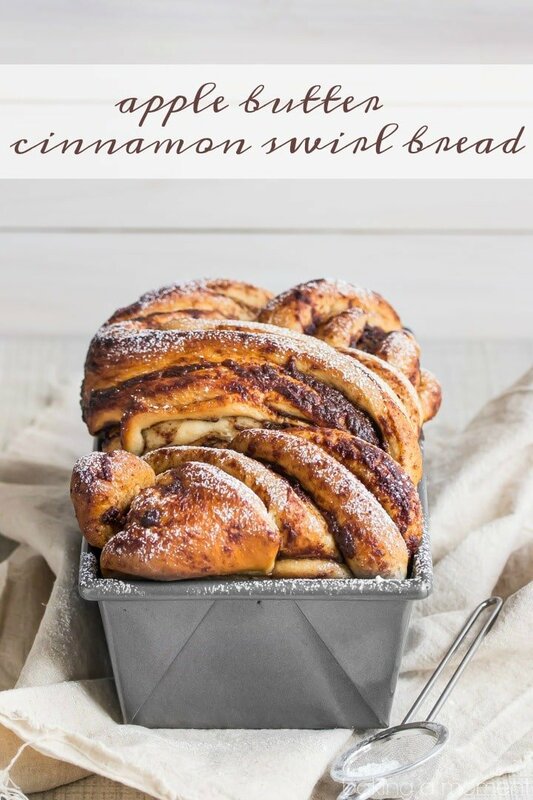 I am a huge fan of Baked by Rachel, and all the gorgeous swirl breads she makes. Especially this one! So when I got the idea to make an apple butter cinnamon swirl bread, I knew I wanted to follow her lead and try this gorgeous technique. It’s surprisingly simple! I know it looks fancy and complicated but really it’s not at all. If you can make cinnamon rolls, then this will be a snap for you. Just roll out the dough into a flat rectangle, and spread the apple butter all over it. Then, sprinkle it with cinnamon sugar, and roll it up in a log, just like you would do with cinnamon rolls. Now, instead of cutting it crosswise into rolls, slice it lengthwise, all the way down, leaving it just barely attached at the one end. After that you just twist the two long pieces together. It feels a little awkward- the log wants to come undone, but it’s ok! You really can’t mess it up. It’s meant to be free-form so the more it waves and twists the better. Look at all those ribbons of apple butter and cinnamon! There’s plenty of sticky filling in every bite. And the bread itself is super moist and soft. 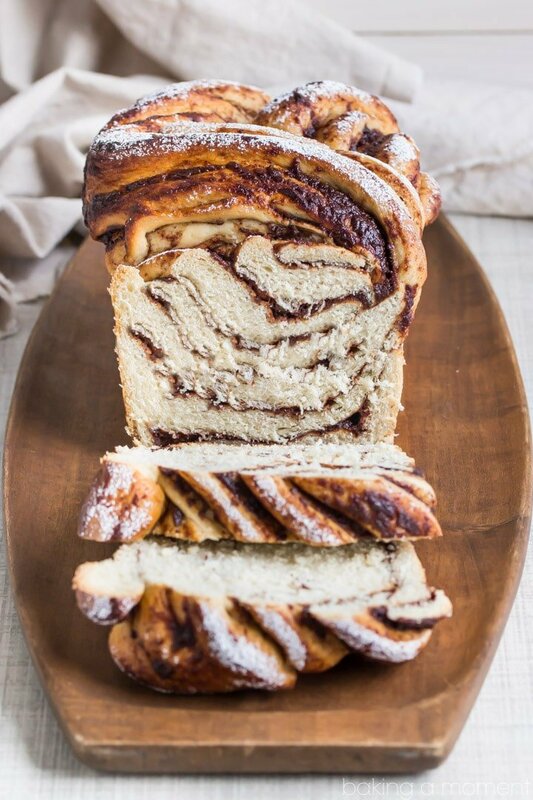 My family loved this apple butter cinnamon swirl bread and I think yours will too! It’s perfect for fall, or even for Thanksgiving or Christmas morning! Place the warm water in a large bowl and sprinkle the yeast on top. Set aside for 5 minutes to allow the yeast to proof. Add the brown sugar and butter. Blend in 2 cups of the flour and the salt until moistened. Place dough in large greased bowl, cover loosely with plastic wrap, and let rise in warm place until doubled in size, 30 to 45 minutes. Lightly mist a 9×5-inch loaf pan with non-stick spray. Stir the granulated sugar and cinnamon together in a small bowl. Punch down the dough and roll it into a rectangle, about 9 inches on the short side and 1/4 inch thick. Spread with a thin layer of apple butter, and top with the cinnamon sugar. Starting at the short side, roll into a tight log (like a cinnamon roll). Using a sharp knife, cut the log in half lengthwise, leaving the two halves attached at one end. Twist the two long pieces together and place in the prepared pan. Cover loosely with plastic wrap, and let rise in warm place until doubled in size, 30 to 45 minutes. Uncover dough and bake 40 to 45 minutes or until loaf sounds hollow when lightly tapped. This looks delicious! Could you post pics of how the cuts and twisting would look? Thanks Marie! I’m so sorry- I didn’t snap any but if you click through to that pesto bread of Rachel’s I had mentioned, she does a good job of it. I hope that helps! Perfect! 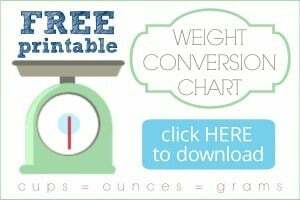 Thank you, her illustrations are a very helpful visual for this timid one 😉 Love your blog Allie, thanks so much for doing all the legwork to give us amazing recipes!!!! Allie, it looks amazing! Love the wooden platter underneath the bread! This looks amazing dear! I loved Baked by Rachel too and glad you were able to make this spectacular bread. So cozy comforting! Thanks Medha! Hope you’re having a great week! I am so intimidated by bread! Could I use my mixer to continue to knead the bread for the ten minutes or does this need to be done by hand? Of course, I just love everything about this loaf. Perfection! That means a lot coming from you Melanie! You are the bread baking queen! Do you know if I can pre make bread and freeze it? At what point do I freeze? Hey Donna! I would just go ahead and bake the bread, and then freeze the baked loaf. I’m not sure if freezing the dough might kill the yeast, or at least interfere with it rising properly. That said, I’m not much of an expert on bread baking. Ask me about cakes, lol! Ok good news … I’m newer to bread myself but I did some research and trial! I got the bread shaped an in a pan and immediately froze. Under 41 degrees retards the yeast to prevent over proofing. So I froze over night, took out and allowed 3 hours to thaw. They are currently rising nicely in the pans and will go in the oven shortly! Can I substitute rapid rise yeast? Yes absolutely! Good luck Sasha! This looks fantastic! Did you just take the twisted bread and do a zig-zag motion with it until it fit in the 9 X 5 loan pan? Hey Lani! Yes that’s pretty much what I did- just mooshed it in there however I could make it fit. Hope that helps! I made your delicious bread today and ran into the issue of all my appl butter squishing out every opening it could find. What could I do to combat this?? Hi Jessica! It does tend to squish out a bit but I think that’s just part of the beauty of this type of bread. It’s squishy and it will definitely give you sticky fingers, lol! If you don’t like that then you could just skip the step of slicing vertically thru the roll, and then it would be more like a cinnamon swirl bread. Hopefully that’s helpful! Hi Cailyn! I live in Philadelphia, PA so I am not at a high elevation like you. This article from King Arthur Flour covers the topic really well though: http://www.kingarthurflour.com/learn/high-altitude-baking.html. I think you’ll find some useful info! Good luck and I hope you enjoy! Yeast: do you mean 1 1/4 oz of yeast, which is then HALF of a packet. OR do you mean a packet of yeast that measures 1 (1/4 ounce)? THAT last one does NOT exist. Please confirm. I don’t want to waste ingredients, time, energy…..
Hey Iris- I am looking at the yeast packets in my baking cupboard now, and they are exactly 1/4 ounce. So the recipe is correct as written: 1 (1/4-ounce) packet. Are you in the US? The brand I have on hand is Fleischmann’s, sold 3 packets together and each packet is 1/4 ounce by weight. Try adding more salt. As much as a full tsp. of table salt or tsp 1/2 of kosher salt. Most grocery stores carry apple butter. Yes, it’s not hard to find- especially at this time of year. Thanks for reading Colleen! I made this bread a couple days ago and not one slice survived long enough for me to get a picture! Fortunately, when you said that this bread is practically fool proof you were speaking the truth. I pretty much did everything wrong or did it the hard way starting from having to make my own apple butter out of last falls apple sauce in the freezer, to the fact that I only had rapid rise yeast which was purchased by accident, and then I did not have a 9 x 5 pan. The homemade apple butter actually turned out great, it was just two hours more stirring than I expected. I dumped in the whole packet of rapid rise yeast with the dry Ingredients. Then I just followed your instructions including letting it rise a second time even though the packet said that that was not necessary. I couldn’t quite get my knife to cut through the length of the dough so I used a pizza cutter. Finally, with Applebutter squeezing out of every possible direction, I wrestled it Like I was wrangling a handful of eels And managed to dump it into a high sided 8 inch cake pan. Once it was finished the second rise I shoved it in the oven and crossed my fingers. Even with all of that going on it was gorgeous and delicious! I made it for my sweetie because she is a huge fan of apple butter. Since we devoured the first loaf so quickly I am headed out to the grocery store to buy more flour tomorrow to make another loaf. Thank you so much for sharing this recipe! Hi Laura! I think if they’re getting there in a day or so that should be fine. But since there aren’t any added preservatives, this bread doesn’t tend to have quite the same shelf life as something store-bought. Is there a way to make the dough the night before and then bake it the next day? I haven’t made bread before so I’m unsure at which point it’d be okay to leave in the fridge, if at all. Hi Diva! You can definitely do that. You can refrigerate the dough before either of the proofs, depending upon how much you want to do ahead. That will retard the rise. Then, when you’re ready to move forward with the remaining steps of the recipe, just remove it from the fridge and allow it to come up to room temperature. Once it hits room temp, let it rise until doubled in volume, then bake. Good luck and let me know if you have any other questions! Made this today and the recipe was so easy to follow. I subbed 1 cup of whole wheat flour, used instant yeast, added flax and chia seeds. Also added 1 tbs more water to account for the WWF substitution. Smelled so good! I agree with one comment though, next time I will add more sugar to the cinnamon/sugar mix. I was expecting it to taste more like a cinnamon roll and the sweetness was just not there. Still a keeper though! Thanks for the recipe! So glad you were happy with it Karina! Thanks so much for sharing your take! Oh my goodness, this is wonderful! I used apple cider instead of water, left out the brown sugar & added 2 tsp Vietnamese cinnamon in the dough. I used my homemade apple butter (made in the Instant Pot) and topped with a mixture of brown sugar & more Vietnamese cinnamon. My house smells like fall!! Thanks for such a great recipe! My pleasure! Your adaptations sound delicious. I’m so happy you liked the recipe! So sorry – the ratings are below “post comment) so I didn’t see it in time on my phone. The addition of apple butter is genius! 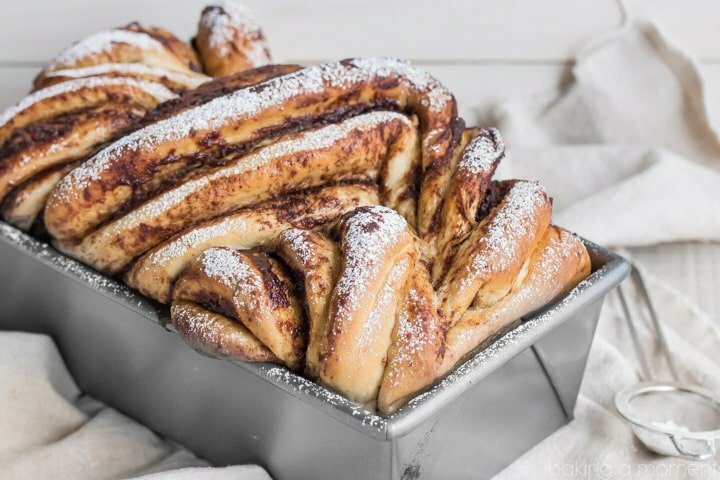 Love this twisty bread! This recipe sounds like it would smell amazing!!! What a yummy breakfast! Love this recipe and about to make it. However, your prep time is way off. If you have 2 rises of 30 minutes, and the time for creating the dough, 10 minutes kneading dough, plus time to roll it out….that’s at least 75 minutes prep. Thanks for the heads up Aisha! But prep time just refers to active time. The rise time is not included because it’s hands-off. Hope you enjoy your bread! Love this recipe! A co-worker gave it to me. I make & can my own apple butter, so this was perfect. I did saute up some fresh apple pieces with brown sugar & apple pie spice & put into the dough. A bit tackier & I probably use more flour, but it’s really yummy. Using this for our Christmas brunch french toast bake! Sounds amazing Jennifer! Thanks for the positive review and I hope you loved your French toast bake! THANK you for a recipe page that is straightforward and relevant – it seems like every recipe I’ve come across recently has a looong (boring) story about their “hubby” who loves this recipe and then 987 pictures of the finished product, making it a chore to even FIND the recipe. Anyway, props to your design and this bread recipe!! So happy you like it! Thanks Erika!